Young children can be like clay. How we help them learn can greatly influence who they become. 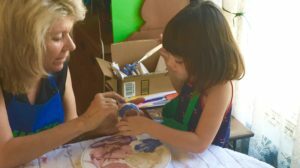 Helping a child learn a new form of art can be a joyful and impactful experience. 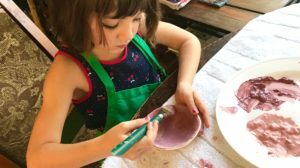 Rebecca, age 5, recently had the opportunity to glaze some of her ceramic clay pieces. I have worked with her via a live video feed because she lives far from me. We worked together across the internet. I also would wedge the clay, roll it out, make a coil…showing by example we had many sessions to create her clay forms. I encouraged her to help with clean up. She learned to let the clay dry over time. Her father shipped the unfired pieces, carefully wrapped, to me. I fired them in the kiln, the first firing is a bisque firing. Then the clay is ready to glaze. 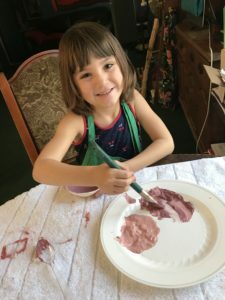 When she and her dad were visiting in this area, we spent the morning glazing her work together. 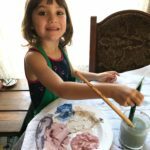 I enjoyed working with her, this was the first time I taught a more complicated form of art (ceramic clay) to a young child. In the past I have used crayons, modeling clay or paint. This experience brought up some good insight that you may enjoy, either with your own children or others. Allow the child to experiment. Too much “helping” will diminish their excitement. Let them experience the feel of the clay in their hands. 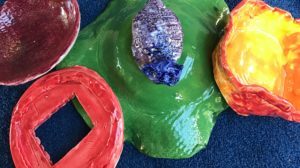 If we enter into “teacher mode” (beyond the basics of making a modality work, i.e., how to handle and put the clay form together) we can take on the “adult/teacher” role and the child is again the submissive one. Ideas can be squelched. The creativity spark may be blown out. Children develop a sense of self and confidences by their choices. Color, shape, size… It is important not to “suggest” away their enthusiastic ideas. Be ready to make changes. In our situation a bowl turned into a picture frame. This became a piece of great pride for Rebecca. Her kindergarten school picture will fill the frame. Rebecca and I had such fun. This was an empowering time. Her finished glazed pieces were radiant with joy. Rebecca is giving some of her work as gifts but the memories of creating this art will always be a part of her.